It's been a while since my last post. I've been doing more newspaper writing and television work in front of the camera than before, but still have my love for being behind the lens. For the sake of not waiting a year for an update, I'll just leave you with this photo of what's in my bag. Although I do not take all of this with me all the time, this is most of my stills equipment. 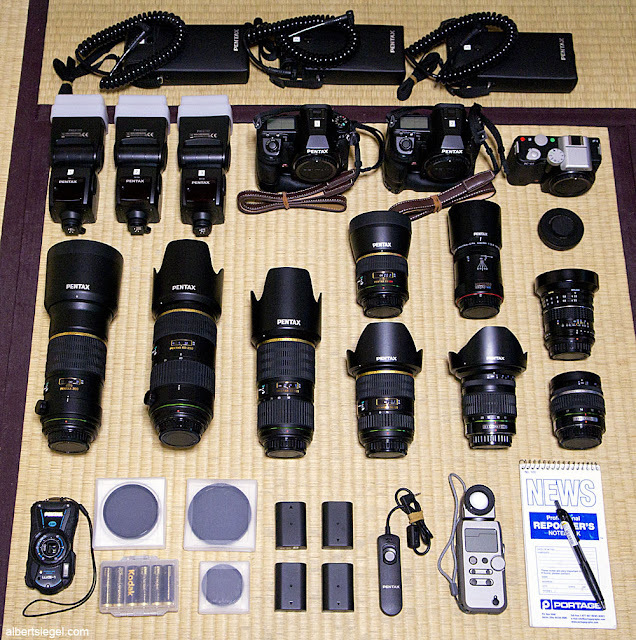 I have a few other lenses and body or two not pictured, but this is more or less what I use for work. Yes, I do prefer crop cameras over 135 full-frame. This might be why I am one of the rare photographers who use Pentax. They seem to be the only ones out there taking the APSC format for DSLR seriously these days. Any questions or comments for me? I'm always happy to reply.